Toshiaki Kawada is considered one of the toughest wrestlers in the history of Japanese wrestling..
November 1985: Toshiaki Kawada was sent to North America by All Japan to gain experience before making it big in Japan..
~~~Fred Behrend’s Texas All-Star Wrestling, Stu Hart’s Stampede Wrestling and Frank Valois’ International Wrestling..
~~~Japanese Force (Toshiaki Kawada & Hiromichi Fuyuki) had a feud with American Force (Paul Diamond & Shawn Michaels)..
January 4, 2004 – Z1 Hustle-1: Toshiaki Kawada defeated Mark Coleman..
March 7, 2004 – Z1 Hustle-2: Mark Coleman & Kevin Randleman defeated Shinya Hashimoto & Toshiaki Kawada..
May 8, 2004 – Z1 Hustle-3: Toshiaki Kawada defeated Mick Foley to retain the Triple Crown..
March 2005: Toshiaki Kawada, 40, announced that he was leaving All Japan Pro Wrestling after 25 years..
May 29, 2005–AJPW: Toshiaki Kawada defeated Shuji Kondo..
October 8, 2005–New Japan PPV: Hiroshi Tanahashi & Shinsuke Nakamura defeated Yoji Anjo & Toshiaki Kawada..
November 23, 2005–U-STYLE Axis: Toshiaki Kawada defeated Mikhail Illoukhine…..
December 25, 2005–HUSTLE: Toshiaki Kawada defeated Taichi Ishikari ..
March 5, 2006–HUSTLE 14: Toshiaki Kawada defeated Kenzo Suzuki..
April 20, 2006–HUSTLE 16: New-Ling Sama/Kawada/Yoji Anjoh/Giant Vabo/Sodom beat Naoya Ogawa/Ohtani/Tajiri/Razor/Erica ..
October 6, 2006–HUSTLE 19: Razor Ramon Hard Gay/Naoya Ogawa/New-Ling Sama defeated Toshiaki Kawada/Sodom/Gomorah..
October 9, 2006–HUSTLE 20: Ogawa/RR-HG/New-Ling Sama/Ohtani/Tajiri beat Kawada/Tenryu/Kohei Sato/Giant Vabo/Monster C..
March 30, 2007: Keiji Muto defeated Toshiaki Kawada to win the 2007 Champion Carnival Tournament..
~~~Kawada beat Satoshi Kojima while Muto beat Taiyo Kea to reach the finals held at Korkuen Hall..
April 22, 2007–All Japan Pro Wrestling: Vampiro defeated Toshiaki Kawada at Korakuen Hall ..
Masanori Horie wrote: Toshiaki Kawada was sent to North America for a year from November 1985. He had gained experience as a pro wrestler in Fred Behrend’s Texas All-Star Wrestling (San Antonio, TX), Stu Hart’s Stampede Wrestling (Calgary), and Frank Valois’ International Wrestling (Montreal). Kawada and Hiromichi Fuyuki, as “Japanese Force” had a feud with “American Force” (Paul Diamond & Shawn Michaels) for the USA Tag Team title in San Antonio,TX, where Ted DiBiase, Chavo Guerrero, Big Bubba (Tugboat/Typhoon/Shockmaster), Austin Idol, Al Madril, and Billy Travis were headliners. 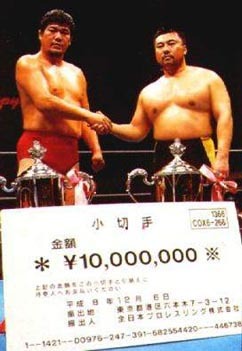 Kawada was billed as “Kio Kawata from Seoul,South Korea” in Stampede Wrestling for a very short time around June 1986. He was under adverse circumstances, and rarely has he talked about his days in American/Canadian wrestling. Perhaps that was his hardest time in his career. However, these experiences certainly brought him up stronger and tougher.